Typical envelopes are not great for the planet, you can't put them in your kerbside recycle bin and unless you cut all the glue strips off you can't take them to your recycling centre. So.. instead of buying envelopes that are really bad for the environment why not save yourself some money and use all your junk mail instead! If you always print your postage off ebay/paypal or royal mail (If you're British) Then it's even more convienient as you just stick the label on as you usually do. 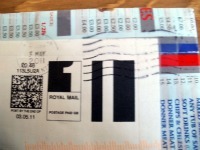 If you use tape that is peelable then you can still recycle the envelope by just peeling off the address label. If not then stick a rectangle of white paper (any scrap you have lying around) Where the stamp will be as the machine has to put a mark over the stamp. Then stick on an address label and its ready to post. It all starts with a rectangular piece of paper, a nice glossy leafet is ideal. In the video I use a page from a peter rabbit book. The book had fallen apart and it seemed a shame to throw it away as the illustrations are beautiful. 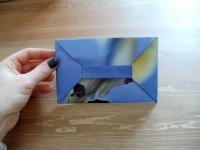 This is a great way to make envelopes for cards you have made yourself. 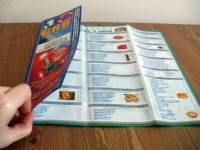 Detailed 10 Page Easy To Follow Instructions, With Colour Photos. 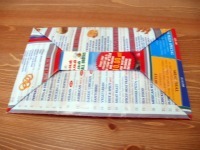 This type of pizza leaflet that comes folded into four makes it easy to start your envelope as some of the folds are already there! Here it is with an address label taped onto the front. I'm told that its better if you stick the top right hand corner of the label right at the top right hand corner of the envelope. That way it runs through the machines better! This is the back of the envelope. I have used low tack tape to fix the flap down and put a little bit on the sides where the corners tuck in. 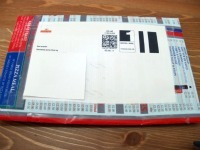 This can be peeled off so that the envelope can be recycled. Here it is back again :) It survived the post intact! You can see where it's been franked. Sign up to our e-zine to keep uptodate with all the new crafts added. Never miss out again! You'll find the sign up form at the top left hand corner of the page. Copyright © 2011 Recycle-crafts.com. All rights reserved.